To introduce COMM-DRV/NT, we are offering a $299.95 SPECIAL LIMITED TIME OFFER for this version! Click here to order now! 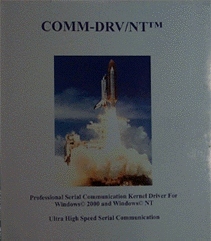 Professional serial communication kernel driver for Windows XP, Windows 2000, & Windows NT. Provides support for the multidrop and nine bit protocol. Supports RS232, RS485, & RS422 as well as microsecond timestamps.